Skydive for as little as $189! We love dogs but for safety reasons we DO NOT ALLOW PETS at the airport. We also love kids. But, if you bring Children they must be under Direct Adult Supervision at all times. We offer Military and Student Discounts on video and photo purchases. Priority Jumper Upgrade: $100. Don't wait to jump! This is a package for faster service at check-in and to get on the first flight of your time-spot along with receiving the other merchandise. It does not buy you a better service with the instructors you hire or on the jump in general. The instructors give the same amazing personalized service to everyone! Cancellation/rescheduling policy: Our no-pressure customer service policy allows you to cancel or reschedule your jump if you notify us at least 48 hours prior to your jump time. Your $50 deposit is refundable or transferable with at least 48 hours notice. We appreciate getting as much notice as possible if changes to your jump time are needed, so that our tandem instructors can more efficiently plan their day. Canceling or rescheduling within the 48 hour window forfeits your deposit. This is necessary because we incur unrecoverable expenses when you cancel or reschedule within 48 hours of your jump time. You may pay for your skydive at the airport with cash (or equivalent), Visa, or MasterCard; or pay in full when you make your reservation. Call (888) Jump-Today to book your reservation. Your reservation will be secured with a $9 per person booking fee and $50 deposit. Book your reservation in advance to secure your spot. The booking fee of $9 is a one-time charge, transferable if you choose to change your reservation time. It is non-refundable. The sky diving weight limit is 240 pounds, but call to inquire if you are over 240. There is an extra charge if you are over 200 pounds. You must be 18 years old to jump. Secure reservations are made by calling our reservation specialists. We look forward to taking you on an thrilling adventure where you will see an amazing skyline view at 120 mph! Ready for the jump? Call today or visit our reservation page to Book Online! 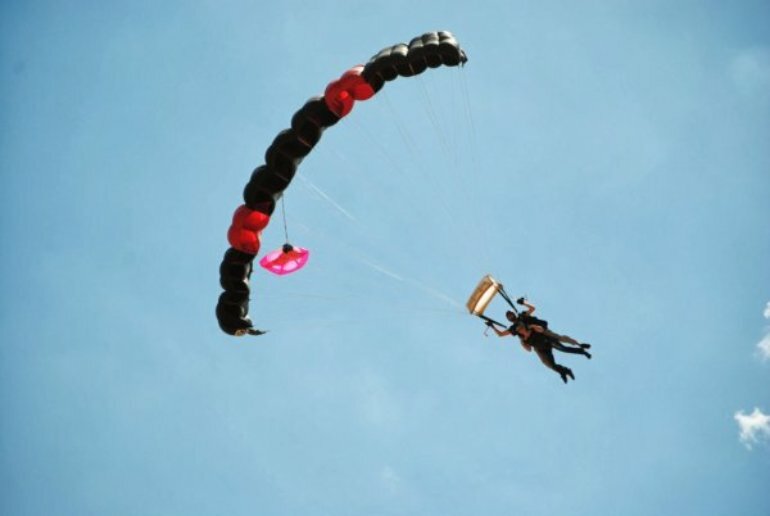 We offer the best sky diving prices in the Washington D.C. area. Cheap? Yes. But we won't ever compromise on Safety or Fun!! Book Today! Sky Diving Lessons - The Safest and the Best! Closest Skydiving Center to Washington D.C. Scenic tandem skydiving for beginners and experienced sky divers, serving Washington D.C., Arlington, Richmond, and Baltimore. Check out our Military and Student Discounts.